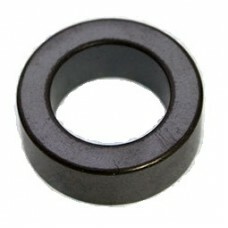 A small ferrite toroid for use in baluns and line-isolators. 8 turns of RG174 (100w) or RG316 (400w) make a great "resistive" balun/choke for 7-30MHz. Our own 100w range of Baluns/Chokes use this ferrite with RG316 coax for a robust and ideal home or portable solution. If you are building a CobWebb balun, use a pair of FT140-61 which is the correct ferrite mix for the 1:4 balun spec. Toroid sizes/types are easy to ID, the "140" translates to 1.4" (size) and the "43" is the ferrite mixture. What type do you need? 43 is good from 7MHz and up (and a good general-purpose 7-30MHz solution) while 31 is good for lower HF bands. Remember, you can stack the cores for increased choking and power-handling. As always, ratings need to factor in the aerial (SWR) match and duty-cycle.